Pour over cracked ice, and enjoy. This drink really shows off the importance of the Vermouth. If you are undecided about your taste for Sweet Vermouth, give this a go as the scotch tones it down. Adjust the vermouth to your tastes. 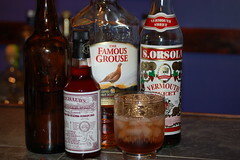 In this version I used Peychauds bitters that give a more orange flavor than Angostura and its herbal flavor.